Imagine evening as a woman, wind as a friend, and every part of nature as an organ in the human body. 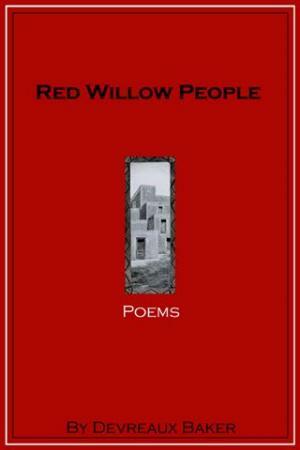 You have now entered the landscape of Devreaux Baker’s newest collection of poetry, Red Willow People. The colors are red, white, yellow and the green shade of clay. The light is supplied by lines from poetry by Federico Garcia Lorca. The smell is sage, cedar, and pinyon pine. These poems are the story of a region, specifically Taos and the Southwestern area of the United States. They are also the story of a people, all the different clans of the Navajo (Dine’). The collection captures the essence of both the region and the people while exploring the universal themes of transformation and rebirth. “Change wants to work her mantra into each being’s heart,” Baker notes in the poem “The Nest,” one of my favorite poems in the book. Baker describes trees as lungs, rocks as bones, and rivers as veins in the beginning of the poem. As the poem continues we see life examined through the lens of middle age, the change an individual body goes through, and at the same time the change nature goes through as Baker’s neighbor cuts down 100-year-old trees so the leaves won’t fall on his house. These kinds of observations can be seen throughout many of the poems, full of the small and big mishandling that humans do to nature. Observations of birth and rebirth are also throughout many of the poems. At the end of “The Nest,” Baker’s calves and thighs become a nest for a little baby bird that the mother bird drops into her lap. It reminded me that even as we age and even through all the changes of this earth, there is constantly new life beginning again. And we can protect that life. The books starts with the series of poems about the Spider Woman, a part of the Dine’ creation story who also teaches the people about weaving. It ends with a poem about coming home, a journey that took many lifetimes... “about burning all the way back to ash and then it was about becoming water, that simple.” That encapsulates this collection. Beautiful images of nature and the Southwestern landscape fuel the simple story of birth and rebirth. I always want to know what the relationship of the writer is with indigenous nations they are writing about, so I was curious about how Baker created her work which relied heavily on Dine’ myth and culture. I believe it’s literary territory that needs to be respected in a serious way, especially if you aren’t from that group of people. I think she told her story honestly in Red Willow People and showed respect for a culture that clearly inspired her greatly.